The Pacific Northwest has this element of outside that seems to be firmly entrenched in the hearts of everyone who lives there. But away from the busy big cities and the coast is a small city whose residents and vistors have taken outside to the next level. Perched along the Columbia River is the city of Hood River, Oregon. 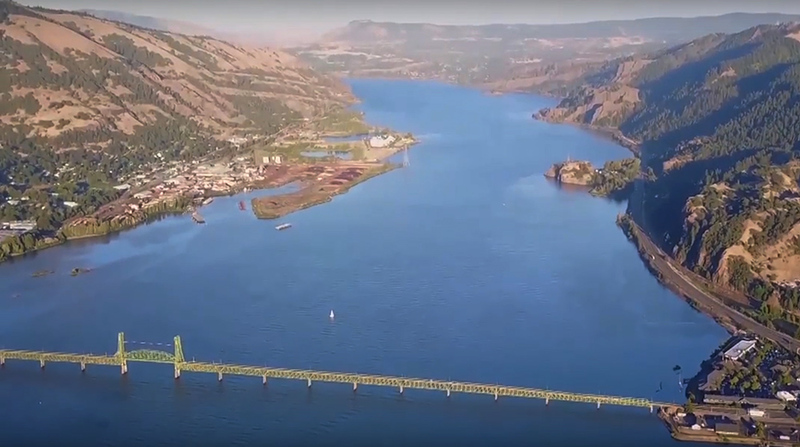 When you’re looking for that hit of adrenaline on your summer getaway in the PNW, look no further than Hood River! Alright, maybe a little further… there’s a lot of cool stuff to see nearby too! Epic views in Hood River. It was a summer of what seemed like endless road tripping, but as I motored along that last hour of winding road – with the river dropping off to my left and the mountains shooting up to my right – it felt like coming home. Hood River isn’t one of those places that you visit just once. It sneaks into your heart a little bit. Kind of in that Stockholm Syndrome sort of way… where it throws you off of a cliff and makes you wonder if you’re going to survive the experience, and when you do gives you a congratulatory squeeze on the shoulder and now you’ve drank the Kool Aid and you want more. Whatever it is, I like it. And when you go… you’ll know exactly what I mean! 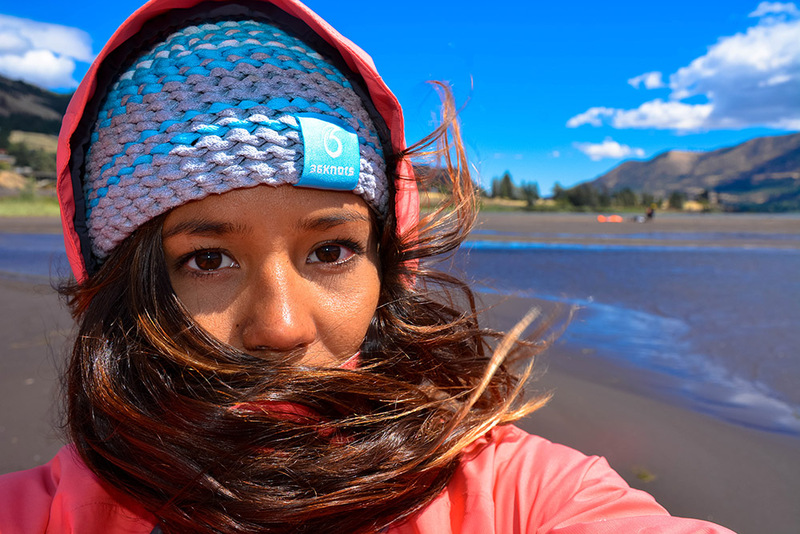 Windy days in Hood River. 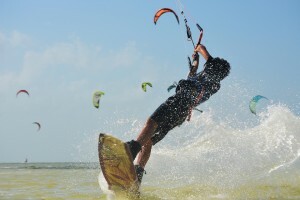 Whether you’re going it alone or going it with a crew (my last trip was an adrenaline fueled weekend with the crew at MACkite and North Kiteboarding), it’s easy to get lost in the great outdoors and overwhelmed with options. To help you make the most of you’re trip, I’ve shared everything I’ve learned in my travels to Hood River in a travel guide to get you started on your adventure! Travel to Hood River: Via PDX or SEA. The closest major airport to Hood River is in Portland (PDX), about 1 hour by car. The next major airport is in Seattle (SEA), about 4 hours by car… or 10 if you get caught up in I5 traffic. Seriously, watch your travel times and avoid rush hour at all costs. If you’re spending time in Portland or Seattle, try using the Waze app to help you through traffic issues. I’ll typically choose which aiport I fly into after checking Google Flights and Hotwire or Kayak to see which combination of flight and rental car is the best deal. A rental car is strongly recommended for a visit to Hood River. If you’re planning to do any sports or exploring, this is the best way to get around – especially if you’re not staying right downtown. Alternatively, a bicycle can get you most places and you can rent a bicycle in town. You can catch the Greyhound from Portland to Hood River if you plan to go it on foot or by bike. Don’t forget to keep a dollar in your pocket for the bridge toll! Where to stay in Hood River, Oregon. I’ll be straight with you here… accommodation in Hood River is not affordable. As I’m generally traveling solo, I’m a big fan of the bugdet options, and these were hard to find in Hood River. Hostel: USD $50 per night for a bed in a dorm room. AirBNB: USD $40 to $350 per night – some unique options like tipis and big houses for groups. Camping: USD $20+ per night – bring your own tent and gear. If you’re really on a budget, there are some free camping options nearby. Many of the more affordable accommodation and camping options are across the river in White Salmon which you will almost definitely need a car to get to – and $1 for the bridge toll. Supply is short in the summer months, so plan ahead or you may find yourself with very few options for accommodation. If you find this to be the case, a great option is to make Portland your overnight base. There are many more options for accommodation here and that beautiful drive isn’t that long! 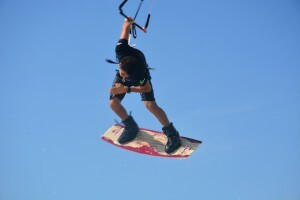 Time for that adrenaline fix… things to do in Hood River. 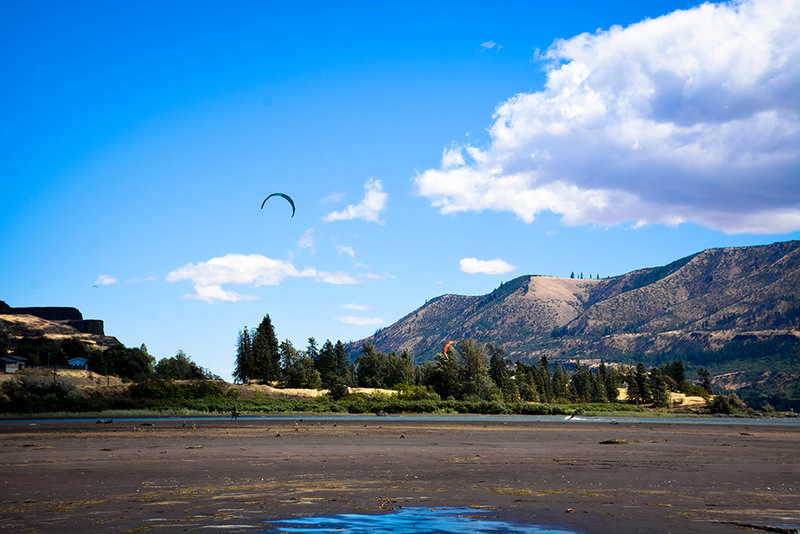 Kiteboarding – Hood River is a hot spot in the kiteboarding community. It’s the home base to many American pro kiteboarders and the American head offices of several kite brands like North Kiteboarding. 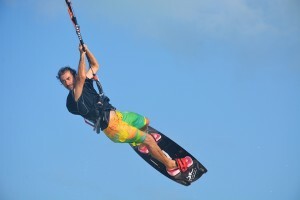 In summer, this spot brings kiters from around the world to have a go in the slider park or participate in one of the many summer events and competitions. This is a great place to see pro kiteboarding in action or to get your taste of a lit life on the water by doing lessons with Cascade Kiteboarding. 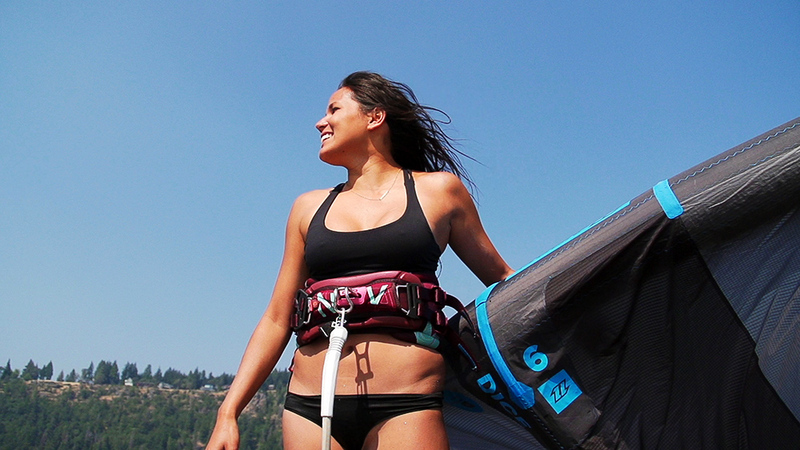 You can see what kiteboarding in Hood River is all about in this video spot guide by MACkite. Columbia River session during the Bridge of the Gods event. Photo by Jim Stringfellow. 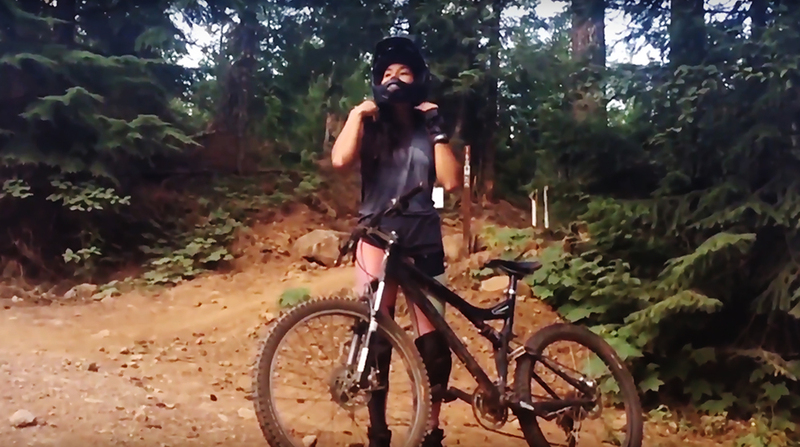 Mountain Biking – You know how I talked about getting thrown off a cliff earlier and then falling in love with Hood River? So that was a real story. Alright, cliff was an exaggeration… but I did go flying off a small bridge. When I was laying on my back at the bottom of the creekbed with my bike on top of me and no significant injuries, I couldn’t stop laughing. The adrenaline rush is real!! So I would recommend starting on some easier trails and riding within your skill level (I didn’t), but I would 1,000% recommend heading out to Post Canyon to take some downhill mountainbike trails. Mountain View Cycles has bike rentals and a shuttle service so you don’t have to hoof it uphill. Definitely get protective gear if you get a little bit drunk and reckless on adrenaline like I do! Other Bike Tours – You don’t have to be barrelling downhill through a forest to enjoy biking in Hood River. There are some much more relaxed options. The top on my To Do list is MountNBarrel – wine tasting by bike! SolRides has an e-bike tour which is perfect for those that wish to do some sightseeing and not have to sweat too hard to get through the day! Getting ready to send it down Post Canyon! Whitewater Rafting – If you want that adrenaline rush on the water, whitewater rafting is a great way to experience the Columbia River. There are rafting tours that take you through class IV and V rapids. 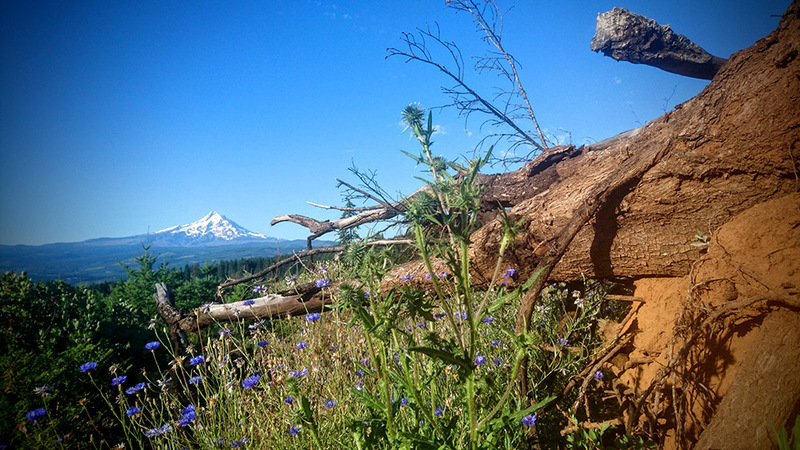 Hiking – There are endless mountains and trails to explore in Hood River, and sometimes the best way to go is to go slow… so here’s some ideas for hiking in Hood River, and a list of the 21 best hikes organized by difficulty to get you started. Wine Tasting – The Columbia Gorge is full of vineyards and a must visit for wine lovers. You can explore any number of wineries, and this list should get you started. If you’d like to organize a wine tour, you can check with one of these tour providers. City Tasting Tour – You can do your own tasting tour in the city of Hood River, where there are plenty of breweries and tasting rooms. For wine, check out Naked Winery and Cascade Cliffs tasting rooms. For beer, Pfriem and Full Sail Brewery have onsite brewing and tasting flights. And if spirits are your thing, visit Camp 1805 for some locally distilled drinks. Best of all? You can DIY this tour on foot! 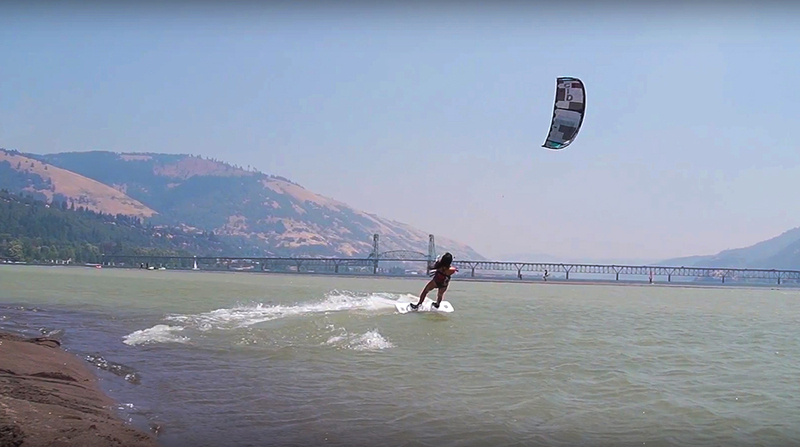 Epic kiteboarding sessions in Hood River. Sometimes the best adventures come to fruition without any advanced planning, so if you’ve got some time to spare, you may be surprised by what comes up. A visit to the Mosier Falls Swimming Hole is a beautiful way to spend a hot summer day. Take a SUP over to Wells Island and walk around the entire island. Don’t forget your life vest though, we got pulled over by the river police on the way! There’s endless opportunities t0 explore in Hood River, and when you’re surrounded by those who have adventure running through their blood, it’s impossible not to have a good time! Hungry? Where to eat in Hood River. For food lovers, you’ll be impressed by the quality of what’s on offer in Hood River. Only an hour away from the foodie hotbed of Portland, this little city has lots of quality offers. 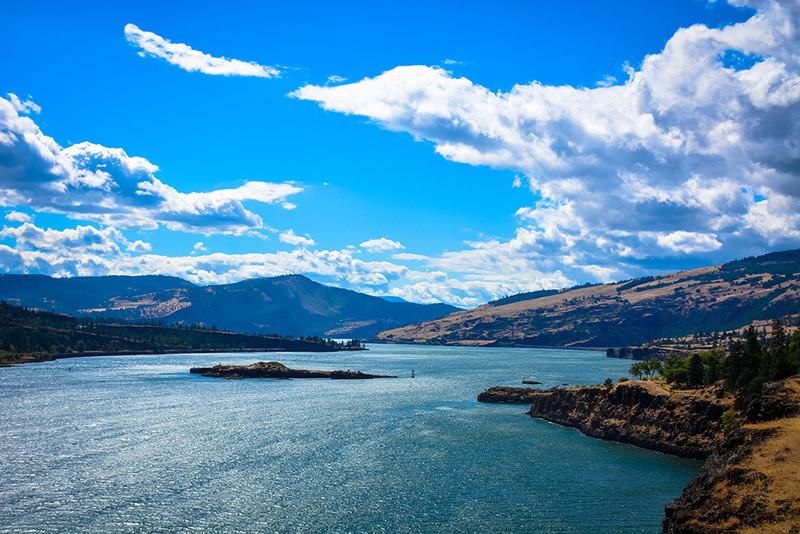 I’ve shared some of my personal favs in Hood River… but don’t let this list limit your choices! 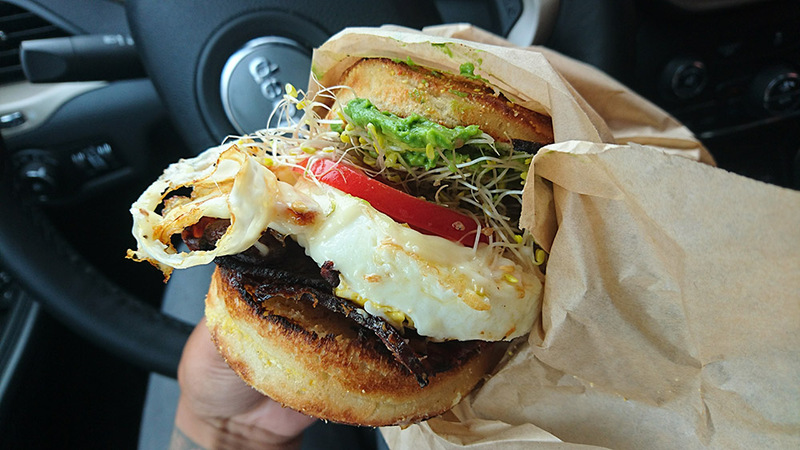 River Daze – The best breakfast sandwich in Hood River, according to my taste buds. I usually go for the Veggie sandwich with bacon on it and a nice dollop of hot sauce! They’ve also got lovingly made coffees and kombucha on tap. Stoked Roasters – With a location down by the water, Stoked is a great place to stop for a caffeine hit or a warmup drink before hitting the water. Solstice – If you have pizza on the brain, Solstice has a woodfire oven that makes delightful pizzas. Their roasted cauliflower and beetroot and burrata salad are both worth a try as well. And of course.. their cocktails. If you appreciate a well-made cocktail, you’ll be in heaven here! Pfriem – Down by the waterfront, Pfriem is a great spot for a brew and a snack after whatever adventure you’ve just wrapped up! This is most definitely not your typical brewery menu. Their food is as carefully made as their beer – well worth a visit. Full Sail Brewing – It’s all about the view at Full Sail. Have a sunset beer out on the patio and try their Salmon Fish & Chips for something different. Kin Eatery – Perhaps one of my best food experiences in Hood River, Kin is all about quality. It’s one of those menus where you only have a few options, but you can trust that each one is incredible. Pick a bottle of local wine to accompany your meal and get your googly eyes ready – this is the perfect date night spot! Kickstand Coffee & Kitchen – Just came off the trails and need to refuel? KickStand has an awesome menu and you’ll be in the great company of Hood River’s biking community. Brian’s Pourhouse – Local comforts on tap in downtown Hood River. Mike’s Ice Cream – For something sweet… the wait in line is worth it on a hot, summer day. Full of stoke in Hood River. Photo by Ryan Goloversic. Every visit to Hood River was such a different experience for me, but each were incredible. I challenged every fear I can imagine… from jumping off of bridges, falling off of bridges (oops), competing in a local kiteboarding event and getting a podium finish, and meeting people who inspired me and changed my life. I’ve gone to fight, to live, to feel, and to heal. And I have memories that could fill entire novels. And I still find myself pulled back to this magical place. Hood River is a hard place to leave in your memories. Once you’ve been, you’ll find yourself wanting to go back. Whether it’s quiet time to reconnect with yourself and be part of nature or a deep dive into the community where you’ll be laughing and clinking glasses with the crew every night, Hood River can give you that. Sometimes you don’t even know what you need until you get there, but the only way to find out is to go! If you have any questions about your trip to Hood River or have already been and want to share some of your own memories, get in touch on Facebook or Instagram! I’d love to hear from you.